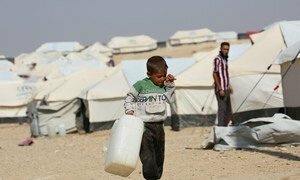 Half of Syria’s children, that’s four million, have grown up only knowing a life of violence, as the war-battered country enters its eighth year of conflict, the United Nations Childrens Fund (UNICEF) said on 13 December 2018. Four million children have been born in Syria since the conflict started, which has touched every single part of the country. In Douma, East Ghouta, just where a Government siege came to an end in April after five years of bombardment, displaced families are returning to the town where the threat of unexploded ordinance is still widespread. Since May 2018, 26 children have reportedly been killed or injured by explosive remnants of war in this one pocket of the country alone. “Almost eight years since the conflict started, the needs are still great,” Fore said. “But the millions of children born during this war and growing up amidst the violence are ready: they want to learn. They want to play. They want to heal.” (SOURCE: UN News).